GOVERNMENT OF ANDHRA PRADESH - Public Services-Filling up of Vacancies in State Police Forces in SRE Districts of Left Wing Extremism in Andhra Pradesh- Orders – Issued. ORDER: 1. In the reference first read above orders have been issued for notifying 10,000 vacant posts of different categories in various departments including 5650 vacant posts belonging to Police department. 2. In the reference second read above, the Home department has stated that in view of security scenario in Andhra Odisha Border (AOB), merging of seven Mandals of Khammam District of Telangana State, ongoing works of Polavaram Project etc, there is imminent need to strengthen the Police Force in the Districts of East Godavari, West Godavari and Visakhapatnam. Therefore, the Department has requested for according permission for filling of (800) vacant posts of Police Constables through direct recruitment in these Districts. 3. After careful examination of the proposal, the Government hereby accords permission for direct recruitment to (800) vacant posts of Police Constables i.e., (600) vacant posts of P.C. (Civil) and (200) vacant posts of P.C. (AR) in the above Districts through A.P.State Level Police Recruitment Board, as details showed below. 4. The (800) vacant posts being accorded permission in the present phase are in addition to the vacant posts already accorded permission vide reference first read above. 5. 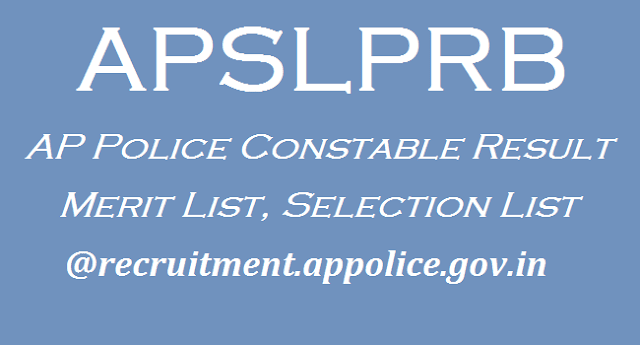 The Chairman, Andhra Pradesh State Level Police Recruitment Board may take appropriate steps for filling the above vacancies through direct recruitment by obtaining the details, roster points and qualifications, etc., from the authorities concerned. 6. The Director General of Police, A.P, Vijayawada shall furnish relevant details of all vacant posts authorized in this order, roster points and qualifications, etc., to the Chairman, Andhra Pradesh State Level Police Recruitment Board immediately. Rc.No.202/R&T/Rect.2/2016-1 Date: 10-05-2017: Recruitment to the posts of SCT Police Constable (Civil) (Men & Women)-3216 Posts, SCT Police Constable (AR) (Men & Women)- 1067 Posts, in Police Department and Warders (Male)-240 Posts & Warders (Female)- 25 Posts, in Prisons & Correctional Services Department were notified vide Notification Rc.No.202/R&T/Rect.2/2016, dt: 22-07-2016. NOTIFICATION - Amendment to the Notification Rc.No.202/R&T/Rect.2/2016-1, dt:22-07-2016: In the Notification Rc.No.202/R&T/Rect.2/2016, ddt:22-07-2016, it was stated that in Para-02(A) (i.e., Distribution of vacancies for Post Code Nos.21 & 22 in the different Units), Limited Recruitment vacancies(i.e., backlog vacancies) and Direct Recruitment vacancies for the posts of SCT Police Constable(Civil) (Men &Women), SCT Police Constable (Armed Reserve) (Men & Women) in Police Department, were notified. 2. The Government vide G.O.Ms.No.76, Finance (HR-1 Plg. & Policy) Dept., dt:10-05-2017, have accorded permission to fill-up 800 vacancies in addition to the vacancies already accorded permission vide G.O.Ms.No.110, Finance (HR-I Plg. & Policy) Dept.,dt:17-6-2016, by direct recruitment for the posts Police Constables for Civil and Armed Reserve in the following Districts through the A.P. State Level Police Recruitment Board, as details shown above. 3. In view of this G.O., the total notified vacancies for the [post of SCT PC(Civil) (Men & Women) becomes 3816 (i.e., 3216 notified earlier and 600 added now). Also the total notified vacancies for the post of SCT PC(AR) (Men & Women) becomes 1267 (i.e., 1067 notified earlier and 200 added now). 4. In view of the above, the following amendment is given for the Notification issued in Rc. No. 202/R&T/Rect.2/2016, dt: 22-07-2016. In the said Notification against Para-2(A) the following is substituted (i.e., Distribution of vacancies for the Post Code Nos.21 & 22, in the following Units. L.R. - Limited Recruitment (Backlog vacancies) – All these vacancies will be filled with the local candidates of the respective Unit only.